One not only reads but views Bernadette Simpson’s An ABC Escapade Through Egypt. Filled with beautiful photographs of Egypt’s rich culture, the book reads like a children’s version of The Amazing Race. Using the alphabet and alliteration as the backbone driving the various excursions through this amazing country, Simpson introduces the reader to the food, entertainment, history, culture, wildlife, transportation, and other facets of Egyptian life. There is even a recipe for kids to make doe-ah (don’t know what this is – pick up the book! ).Want to learn more about a Camel’s hump? What about the many uses of date palm trees? Learn about the many types mangos and what a prickly pear is. Are hieroglyphics more your interest? Well it’s all here.Don’t let the title fool you. This is not a preschool letter learning book for pre-school children, though they are sure to enjoy the wonderful pictures. This is a thoughtful, informative journey for 9-12 year olds which can be fully appreciated by adults as well. Certainly, Bernadette’s rich background, having lived all over the world and now residing in the small town of Dahab in South Sinai, has provided her the sensitivity to experience and convey the wonders of Egypt.Be sure to visit Bernadette’s website to learn more about her and Egypt (http://www.bernadettesimpson.com). As an extra treat, visit Ginda Simpson’s (Berndaette’s mother) webpage; she is an artist and writer living in Umbria Italy (http://www.gindasimpson.com/NEW%20Ind...). This is a great book! My daughter and I read it at bedtime and she just loves the pictures and she likes to tell people what she has learned about the animals and food in Egypt. I think the lessons included are clever, most are too hard for my daughter, she is only 5 now. But, it could be the kind of thing she goes back to later and gets even more information out of. I imagine it as a reference book for her for a long time. And, I still have not had time to check out the online resources that accompany this book. A Social Studies Teacher Must Have!!!! What I loved about this book was how it brought ancient Egypt into modern times. The information and pictures were fantastic and it kept my attention until the very end. An ABC Escapade through Egypt taught me something new and that is what every book should do. As a history teacher I highly recommend this book to educators, parents, and especially students. Well done. Synopsis: This book is exactly what the title says it is: an escapade through modern-day Egypt using the alphabet as a guide.My two cents: This book is an alliterative masterpiece that belongs on every bookshelf in every home. I was enthralled from the first page. Ms Simpson manages to capture life in modern Egypt with a few simple letters, easy to understand wording and magnificent photographs. From (A)thletes to the city of (Z)amalek, with (E)grets, the (R)ed Sea and (U)rchins in between, it is a truly amazing journey.While making use of the alphabet to bring the reader into Ms Simpson's world, this is not your typical preschool ABC book. It is written at a more advanced level, more for 9-12 year olds. However, this will be a primary book I use in teaching my own young children about the wonders of modern-day Egypt. I won this book from a free book giveaway listed at http://iamareadernotawriter.blogspot.com... At first glance, I was expecting an ABC book for preschoolers. This book is so much more than that. The words chosen for each letter introduce some of the well known aspects of Egypt such as Camels and Hieroglyphs but also less well known like the Jerboas and Prickly pears. While providing beautiful color photographs that children would certainly be drawn to, the author also provides detailed information about the words chosen for each letter. For example, for the letter K there is the heading of “Kilos of crunchy konafa” with a color photograph of this traditional dessert served in Egypt and detailed information for when it is served and even how it is weighed in kilograms at the bakery. The author even goes one step further to include information about how there was an attempt at a world record for the largest platter of Konafa. Each page cleverly integrates italicized Egyptian Arabic words and the author provides great care in making the pronunciation and meaning of the words known in the glossary at the back of the book. Included are interesting facts and even a recipe. Those curious in learning more are also encouraged to visit the author’s website. It was here that I learned the primary audience for her book was Egyptian children learning English as a second language. There are also reading guides and activities on her website to expand the readers learning further. I certainly enjoyed this trip through Egypt and felt the author wonderfully captured the culture and lifestyle. Disclosure: I received this by book the author in exchange for an honest review.Now time for my review:Confession time, as a kid I was kind of a nerd. Allow me to explain what I mean, I would check out nonfiction books on countries for fun and take avid notes on them. Why would I do this in the summer for fun? Because I wanted to know about different cultures, different people, and different countries. I’ve read a lot of books about different countries, but none as entertaining and as creatively organized as Bernadette’s book. So many of these books were boring and hard to get through, this is not the case with Bernadette’s book. This book is geared for a MG reader, but I think readers of all ages will enjoy this book.With this book, readers can get a glimpse into the culture of Egypt through her ingenious ABC’s of Egypt. The book is full of exciting pictures, masterful alliteration, and intriguing pages full of information. With this book, Bernadette offers readers a chance to look at the pictures and titles and gain an insight into Egypt. However, if readers look on a deeper level, they will be amazed by the information they will find. As I read this book, I learned many new things about Egypt. I had no idea that people can balance a whole tray of baladi bread on their head, that there is a small fox called the fennec fox that lives on the beaches, or that there is a lantern called the fa-wa-neess used in Ramadan. And these are only a few of the treasures I learned. For a more extended review, please visit this link. I am a great believer in getting kids to read by letting them read what they enjoy or what interests them the most. 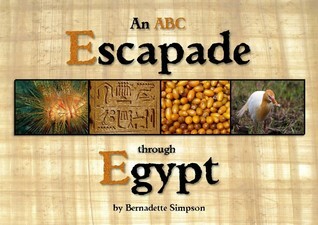 An ABC Escapade Through Egypt by Bernadette Simpson is one such book. Packed with gorgeous photographs and a vibey, interesting approach to layout, this striking book is sure to captivate any 8-12-year-old. By mixing modern fun facts with historical, cultural, and geographical elements of Egypt the author has hit on the perfect way to seamlessly merge the old with the new in this fun book. The author weaves snippets into each section so that almost without knowing it, the reader is learning about the weather, the food (including a few recipes! ), the animals, the people, the cities, and the past all at once. Alliterative phrases sing to the young reader in ways that compel further reading: Jumping Jerboas, Gallivanting Goats, Oodles of Olives, and Piles of Prickly Pear—irresistible! The author has also cleverly inserted little puzzles and quizzes into pages to test the reader’s memory of what he or she has just read. What better way to get kids to learn. Unusual words also play their part and when one reads about things like baladi, konafa, and felukat, who could close the book without discovering what they mean. The author’s passion for Egypt is palpable and leaps from each page. A multimedia website completes this adventure through Egypt, and encourages the young reader to explore further. I highly recommend this book for parents and teachers to introduce a new and interesting country to children. I just received my copy a Goodreads Giveaway, Thank you Ms Bernadette Simpson and Good Reads. This is my first book win with the author's signature inclosed in the book,it is so nice to have the author sign it, I think its wonderful! This book has so many great facts about Egypt starting with the letters from A to Z. The book when you read it, its like your on an educational tour of Egypt, the author writes as if she is there with you. I think its cute, its not what I expected but it is a good surprise, it is educational and not boring. It is a good read with your child and could even be a good tool to get facts from if your child is to do a report for school on Egypt,or just simply a good read. Furthermore it is a virtual tour of Egypt with great pictures and facts. I can't wait to share this with my child to see what he thinks. When I first glanced at the “ABC” in the title I thought it might be a book only for young children learning their ABC’s but it really is a joy to read for all ages. My five-year-old son loves the photographs of all the wonderful things in Egypt and I like that it has a lot of great educational information. The text is not boring either. This is one of the most easy to read yet very informative books I’ve seen. I recommend this book to all children, anyone wanting to learn more about Egypt, traveling to Egypt or looking for just an enjoyable read with a lot of beautiful images. It's a book on Egyptian culture literally from A to Z. It is a very enjoyable book, with simple descriptions and tons of pictures that illustrate the best of Egyptian culture, even some things that I didn't get to see during my trip to Egypt. And I had the chance to meet Bernadette. She is an awesome lady. This is amazing, fantastic book! I can't say enough about the content and the illustrations. I wish I found it when my children were smaller. I would recommend it especially to PARENTS OF GIFTED CHILDREN! You can read it with gifted kids as early as 2 years of age! Parents whose children love DK Eyewitness books should note this book and the author. I won this book through the First Reads program.A good overview of some of the delights of Egyptian culture. Good for introductions to some new things, and for those that want to expand children's horizons.I really liked that in addition to the bits of history, and social studies it had math and languages learning too. My photo there is enough to give it four stars. I'm Kidding, the book itself is nice and amusing, and I guess non-Egyptian may like it even more. I liked the idea and the pictures, and I think it's a nice book for children. But this is from an Egyptian perspective. A great book by a very gifted writer and what a wonderful way for kids to learn about another culture!